Used bookstores are an important part of the re-reading and eventually, the recycling process for books. Here in Metro Vancouver, we have a great network of used bookstores, thrift stores, and Little Libraries to complete the mix of potential places we can bring our books when we finish reading and want to pass them on to their next reader. Western Sky Books prioritizes working within those existing networks in the Tri-Cities. As the only used bookstore in the immediate area, we are uniquely placed to help our customers and neighbours figure out how to get their books passed on, and where that appropriately might be. When a book has meaning for you and your family, it can be hard to send it to recycling. As well, we spend a lot of money on our book collections, so it can be disheartening to think about that cost not being valued. Still, books are commodities that have shelf-lives, just like any other consumer item. Keeping them in great shape means they will have a place in the rereading cycle. Most times, but not always. So let’s take a deep breath and figure out where to send our books. First up: Recycling is work. The more stuff we have, the more work we do to get the stuff out of our house. We spend a lot of time sorting, sorting, sorting. The recycling systems are complicated and require us to pay attention to details. Sometimes, we just want to get the stuff out, and out now, so we put everything in a box, load up the SUV, bring it to the nearest thrift store, and wash our hands of it. The thing is, this just passes on the work of sorting to the local non-profit volunteers or paid staff to do. Which costs time and money and undermines the fundraising potential of passing along your stuff to a charity. A question we can ask ourselves is: ‘If I saw this at a garage sale or a thrift store, would I buy it?’ If the answer is no, then the item, in this case the book, should probably not go in the ‘go to charity’ or ‘go to the used bookstore’ box. If you tend to bring your belongings to one of the larger chain thrift stores, here’s a question to ask yourself: do you know what happens to items they cannot sell? If you don’t know the answer to that, then it is worth it to ask. You will often find staff do not know or will give you conflicting information. In this case, there is a high likelihood the items will go to the dump. So the time, gas, and labour costs involved might just be an indication that it would be better to deal with the disposal ourselves, especially if we care about our carbon footprint. 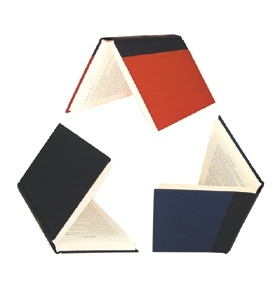 Here’s something most of us don’t know: books are not, as a rule, recyclable. This is due to the various glues, bindings, and processes in making the covers in particular. Books placed in blue boxes eventually go to the dump. You can remove covers, spiral bindings and staples, and then cut the spine which has glue attached, put all that in the garbage, then put the loose pages in the blue bin. But realistically, most of us are not going to do those things. Sometimes we will, but most times we won’t. We all have them. Books that are well read, well loved, coffee or jam stained, water damaged, with torn pages, marked up and draw in. In any case, as great as these books and the stories they tell may be, no matter how much we enjoyed them, they should not be sent to thrift stores or used bookstores. Instead, they can be sorted to send for pulping. Here in Port Coquitlam, we have the great option of bringing these books to the local recycler, Happy Stan’s. They have white bins specifically for books in the parking lot when you pull in, and they send those books to Cascades, a Canadian paper recycler and manufacturer, for pulping. Remember your 3-Rs? Aside from ‘rereading,’ we can also ‘repurpose’ books. Books in bad condition are fabulous material for all kinds of art and craft projects. Now you’ve sorted your books and you still have a box or two or three which are in reasonable condition for rereading. What’s next? Western Sky Books (Port Coquitlam/Tri-Cities) We also come to your home to pick up books at no charge. Call 604-461-5602 for details. Here is a map to find a Little Library in the Tri-Cities. Port Coquitlam has several new Little Libraries, as a special project between the Tri-Cities Literacy Committee, Avenues of Change (Coquitlam River) and West Coast Family Centres. Raincity Housing and Transitions Society also accept small donations of books for their programs. It is always best to call your local library to ask what they accept. Each local library has their own criteria. Please note that when you simply drop off books at your local library, there is no guarantee it will end up on the shelves or in a book sale. It also creates work for librarians and other staff and volunteers. Here is the information provided by each of the Tri-Cities libraries in case you are looking to support your local library with a donation of books. 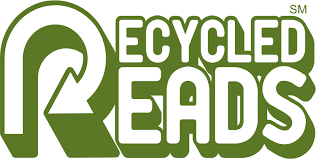 You will find that if you go to the Metro Vancouver Recycles page, they recommend you drop your books in a Discover Books book bin. There are several of these blue book bins around the Lower Mainland. Discover Books has a local hub in New Westminster to process books. It is an American company, but even so, they are an important part of the local book recycling system. They sell books online and books which are not resellable do get sent for pulping. Their main centres are in Washington State, and when you order books from them, they come from Washington too. Hemingway Books and The Bookman, well-established used bookstores in Abbotsford, offer cash (and credit) for books. The Creative Bookworm in Langley also offers cash or credit options. It is best to contact each store to find out their specific requirements and policies. If you have a camera and some basic computer skills, you can sell your books online. Check out the range in price by using BookFinder. They list all of the ‘bookselling’ places online. Craigslist: there is a brisk and steady trade in used books on craigslist. AbeBooks: used and antiquarian booksellers use Abe Books to post and sell their books which have more value in them. They also have a great textbook buyback page. You can set your own shipping rates at AbeBooks, too. Amazon, Biblio, and Ebay: Set up your account and start selling. Just remember that shipping will often cost more then their set limits, so your book selling price might need to absorb the costs of shipping. Are you downsizing? We have found Maxsold to be helpful for local families that hope to get some of the cash value from their belongings, including books. See their website for more information. There are also several local small businesses that help with home reorganizing and decluttering (though we do not think of books as clutter!) We recommend The Task Fairy. Textbooks older than two years old. If you think a texbook has value, try selling it on your school social media boards, through facebook, or even craigslist. There is also the option of checking to see if AbeBooks textbook buy back system will take the book. Textbooks go out of date quickly, so only the larger thrift stores and some specialty used bookstores can take them in. If in doubt, or if you are not able or willing to do the research, it is best to send your textbooks to pulp. Encyclopedia, Reference series (including children’s reference): Used to be, our parents and grandparents gathered these reference books for our homes. These volumes are often very well made and look nice too. And the information in them is still relevant and useful. Still, most families do not use them now. Nor do a lot of us have the space to keep them. Once again, if you have the time, skill set and inclination, do try a resell site of your choice. Otherwise, we recommend Happy Stan’s. Old Magazines: check with your doctor’s office, your child’s daycare or school teacher or even the local Brownie pack . They may be able to take old magazines. Some used bookstores do too. So once, more, it is worth it to make some phone calls or send some emails of inquiry. In most cases though, you can put those magazines right into the blue bin or include them with the books you take to the recycler. Colouring and Activity Books: Your child only drew on or coloured one or two pages, or they made the figurine that came with the book but the book is still in good condition. Even so, it cannot be resold at a used bookstore and even most thrift stores. These books are worth a try at a Little Library, but if you notice it is still there after a week or so, then it is best to take it and place it in the stack to do go pulping. DVD’s/VHS tapes/Cassette Tapes: Did the book came with a DVD or CD? Do you have that DVD or CD? Is the DVD/CD usable? Unless the book itself is in very good condition, and the material is somehow now available online, these items are not going to sell. So the book goes to pulping, the CD/DVD goes to electronic recycling. The only exception to this will be audiobooks. Please do bring audiobooks in any format, in to the used bookstore. Strip cover books: books with no front cover, especially small paperbacks, are usually considered stolen, as they were likely removed from a new bookstore or publisher’s recycling stream. Still, there are a lot of them around. And no used bookstore or thrift store can sell them, and not many people will read a book without a cover. So send these books to pulp. A shorter version of this article appears in the January/February 2019 edition of What’s On Port Coquitlam, with thanks!